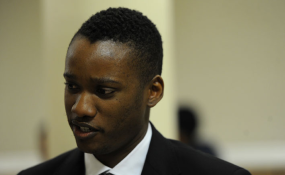 Cape Town — A state prosecutor has told the Randburg Magistrate Court that the State will no longer be prosecuting Duduzane Zuma on one of his two charges of culpable homicide following new evidence from a pathologist, The Citizen reports. The charges against former president Jacob Zuma's son came after his Porsche collided with a taxi in 2014, killing one commuter at the scene and injuring three others, one of whom died later. Duduzane Zuma admitted to losing control of his car after driving through a puddle of water just before the crash but denied that he is guitly of of culpable homicide, according to Eyewitness News.